The Jewish Free Press, Calgary, May 3, 2013, p. 16. Brill, Alan. Thinking God: The Mysticism of Rabbi Zadok of Lublin. New York and Jersey City: The Michael Scharf Publication Trust of the Yeshiva University Press, 2002. Elman, Yaakov. “Reb Zadok Hakohen of Lublin on Prophecy in the Halakhic Process.” In Jewish Law Association Studies I, 1–16. Chico, CA: Scholars Pr, 1985. Unger, Szmuel. Toldot ha-Kohen mi-Lublin: Yemé Ḥayyaṿ, Ḳorotaṿ u-Sefarav. Lublin: M. Shnaidmeser, 1923. One of the most familiar customs currently associated with the festival of Shavu'ot is the "tikkun leil Shav’ot," an all-night vigil of Torah study. 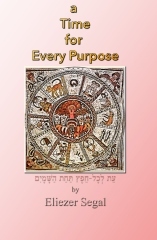 This custom, which originated in kabbalistic circles, was mentioned in the Zohar and was first observed in the sixteenth century by Rabbi Joseph Karo, under the direction of his supernatural advisor, his "Maggid." Like several kabbalistic practices that entered the wider Jewish mainstream, the Tikkun's transformation into a quasi-normative rite was facilitated by the seventeenth-century Polish scholar Rabbi Abraham “Abe'leh” Gombiner, author of the influential Magen Abraham commentary to the Shulḥan Arukh code of Jewish law. Not content with relying on kabbalistic tradition, or even on popular custom, Rabbi Gombiner strove to base the Tikkun on more authoritative rabbinic texts. In this connection he cited a midrashic parable about a king who declared his intention of visiting a city, but on his arrival found that the residents had overslept. The king commanded that they be roused to the blasts of trumpets, and he ordered the governor to lead them out to greet the king in his palace. The king in this parable represents God, and the governor is Moses. The biblical narrative of the giving of the Torah relates how God issued an advance proclamation of the coming revelation, apprising them that he would be coming down to address his subjects. It goes on to describe the sounds of trumpets, thunder and lightning as Moses led his people to Mount Sinai. The midrashic text concludes: "Israel slumbered throughout that night because sleep on Shavu'ot is pleasurable and the night is short." This incident furnishes the context for God’s admonition (as stated by Isaiah): "Why when I came was there no man? Why when I called was there none to answer?" According to the Magen Abraham, it is in order to make amends for this inappropriate behaviour by our ancestors that subsequent generations accepted upon themselves the duty of learning Torah all night during Shavu'ot, the anniversary of the revelation. As it happens, not all Jewish scholars were persuaded by Rabbi Gombiner's reading of the midrash. Notably, Rabbi Zadok HaKohen of Lublin, the nineteenth-century talmudist who became an adherent of Hasidism, challenged his key premise, that it was improper for the Israelites to have gotten in a good night's sleep before proceeding to their momentous encounter with the Almighty. Quite the contrary, insisted Rabbi Zadok—the midrash's characterization of the sleep as "pleasurable" doesn't sound much like a condemnation of a lapse that demands correction; indeed, by sleeping our ancestors might well have been accomplishing a laudable spiritual task. Basing himself on a passage in the Zohar, Rabbi Zadok described the ancient Israelites as readying themselves for the revelation by means of a profound purification process that consisted chiefly of absorbing the "waters" of Torah into their very beings and purging all remnants of worldliness from their souls. Rabbinic doctrine, we must recall, asserts that there are two Torahs. In addition to the written Torah consisting of the five books of Moses that are inscribed in ink on a scroll, there is also an oral Torah that is typically acquired through study, analysis and argumentation. While later generations would enjoy the opportunity to participate in the full regimen of talmudic dialectic, the oral Torah was not yet available to the Israelites of Moses's era. Instead, they adopted a strategy of binding themselves to the Almighty by means of sleep—thereby surrendering themselves totally to God. Rabbi Zadok believed this kind of sleep can effect a higher level of spiritual cleansing than the intellectual exertions associated with the actual study of the oral Torah. In this connection he cited a midrashic tradition that designated nighttime as the preferred time for the study of the oral Torah. According to rabbinic tradition, Solomon was designated “Yedidya,” the Lord’s beloved one, lending special significance to the psalm’s statement that “he gives his beloved sleep.” There exists a sublime spiritual level that can only be achieved by means of slumber. Rabbi Zadok enumerated other righteous figures who communed with God in their sleep. He contrasted the devotion of Abraham, whose religious insights were acquired by means of intense personal effort, to that of Jacob who entrusted his fate entirely into divine hands and was vouchsafed an effortless revelation while he lay asleep at Beth-El. This is the true meaning of "fear of God" that is motivated by a powerful desire for Torah wisdom, and this was the spiritual sweetness to which the Israelites were aspiring as they enjoyed their pleasurable—or even ecstatic!—sleep on the night of the first Shavu'ot.